1. Research in Ghana shows how weaver ants could be exploited to control cocoa mirids and other insect pests – this reduces pesticide use and its associated impacts on human health and the environment. 2. CIRAD have identified new sources of disease resistance in wild cocoa in French Guiana, which is now being used to breed clones with better resistance for the fungus Phytophthora megakarya in West Africa, and for local strains of the disease in French Guiana. Some of the largest international clients for cocoa are now reluctant to buy cocoa that has been sprayed with pesticides due to the increasing global consumer perception of the threat they pose to humans and the environment. This is a big problem for the Ghanaian government who, for the last 6 years, have been encouraging farmers in the country to use pesticides through a mass spraying programme. They offer free spraying 3 times a year for every well kept farm, encouraging farmers to maintain farms in good condition and resulting in increased harvest for farmers in return. Decreased demand of insecticide-treated cocoa and worries about insects developing resistance to insecticides means that a reliable alternative is needed. During consultations, farmers suggested using Oecophylla longinoda, a very common weaver ant in Ghanaian cocoa farms and forests, as an alternative to insecticide use and scientists agree that this is a feasible option. The ant has a painful bite but reduces pest damage as a biological control agent. Tests showed that pest damage is reduced considerably by weaver ants, but only when they are present in large numbers and distributed throughout the plantation. High coverage of a plantation with ants is difficult to establish and they may never be as effective as pesticides so farmers would have to accept a lower yield if no pesticide was to be used – a delicate issue considering the Ghanaian farmer does not have a large profit margin. We may have to pay a higher price if we want to sustain organic production of our chocolate without harming farmers’ incomes. Black pod caused by Phytophthora species causes substantial yield losses in cocoa producing regions throughout the world, but particularly and increasingly in West Africa since the emergence of the aggressive invasive species, P. megakarya (see Distribution Maps of Plant Diseases No. 721, 1996). Genetic resistance is the most promising solution but resistant clones have proved difficult to find. Cocoa originated in South America before being transferred to Africa and breeders have begun looking for sources of resistance in its home continent. Surveys in French Guiana have unearthed clones with resistance to the pan-tropical species P. palmivora and one with resistance to P. megakarya. Closer inspection through lab leaf tests indicated a high level of resistance (Paulin, Ducamp and Lachenaud, 2008). Tests will continue as part of the new EU funded “Dicacao” 3-year project to find resistance against the main 3 diseases of cocoa in French Guiana: P. palmivora, Moniliophthora perniciosa, cause of witches’ broom, and Ceratocystis fimbriata, cause of ceratocystis wilt. The most resistant of these will then be tested against P. megakarya with the ultimate goal to transfer selected resistant clones to Africa for incorporation into breeding programmes there. Paulin, D. Ducamp, M. Lachenaud, P. (2008) Crop Protection 27 (7), 1143-1147. Abstract: Cocoa black pod rot, a disease caused by oomycetes of the genus Phytophthora, causes substantial yield losses throughout the world, particularly in Africa with the very aggressive species Phytophthora megakarya. In order to reduce the impact of that pathogen, priority is given to genetic control through more resistant cultivars, and breeders are seeking sources of resistance in wild cocoa trees. Wild cocoa trees were surveyed in French Guiana between 1985 and 1995, leading to the collection of abundant plant material from more than 200 mother trees originating from five river basins. We present here the results of tests to assess resistance to the species P. megakarya (a species only existing in Africa), conducted at CIRAD in Montpellier, France, on circa 40 genotypes collected in the Camopi river basin, along with approximately 20 genotypes from other populations (Kérindioutou, Borne 7, Euleupousing, Pina and Oyapok). The strain used for artificial inoculation was NS269, isolated in Cameroon. 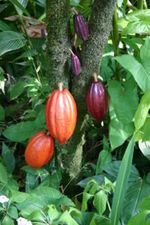 Seven cacao clones were classified as "highly resistant" and 29 as "resistant", some of which displayed greater resistance to P. megakarya than the reference resistant clone IMC 47. This study suggests that the wild material from French Guiana could play a significant role in controlling P. megakarya in Africa and also Phytophthora palmivora in all cocoa-producing zones. CABI/USDA (2008) GRO-Cocoa, Issue 13. CABI/EPPO (1996) Phytophthora megakarya. Distribution Maps of Plant Diseases, Map No. 721 (Edition 1). CAB International, Wallingford, UK.